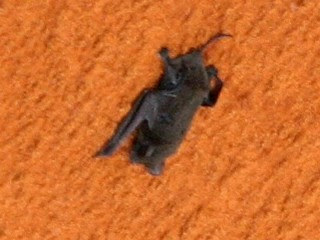 When the Space Shuttle Discovery blasted into orbit two days ago, it might have taken this bat along for the ride. NASA technicians spotted the flying rodent clawed up against the vehicle's external tank during inspections. And it was thought that it would eventually take fly off on its own. But as Discovery roared from the launch pad, a tiny black speck was spotted clinging to the side of the tank. Sure enough, it was the bat. Nobody has seen the bat since Discovery cleared the tower, but it was last seen still holding on to the vehicle.